Abu Bakr al Rabeeah is an Edmonton-based teenager and Winnie Yeung was his high school English teacher. Together they wrote and published Homes, a riveting memoir of al Rabeeah's experiences as a young boy in Syria in the midst of civil war. In the memoir, a 15-year-old al Rabeeah recounts his childhood in the middle of civil war. Though he witnessed tremendous violence, the book explores his tight-knit family and his boyhood love of soccer and video games. 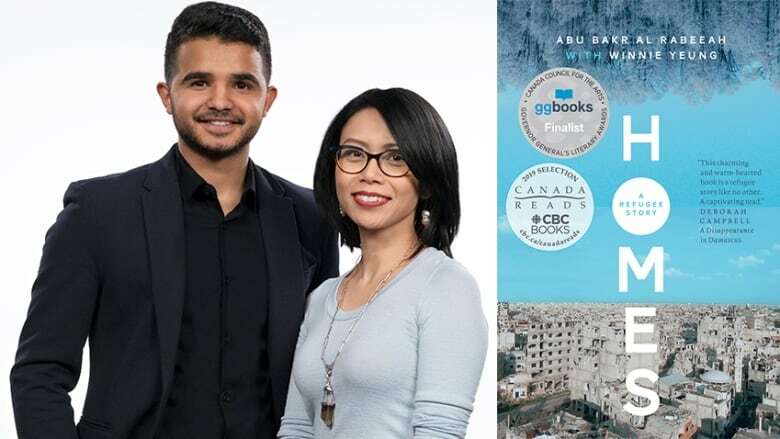 Al Rabeeah and Yeung spoke with CBC Books about their respective love of books and reading. Al Rabeeah: I love reading. Back in Syria I would read a lot of poetry books. When I came to Canada, one of the first books I loved reading was The Absolutely True Diary of a Part-Time Indian by Sherman Alexie. It really touched me. It was a good fit for someone of my age. The book is about a boy's teenage years, about being Indigenous and the issues teens face when growing up. I could understand what he was going through in the book. Yeung: Too many to name! Books have been a big part of my life. My father's a big reader and it used to drive my mother crazy because my dad and I would be sitting at the dinner table with books while eating. I love Canadian fiction — including books by Margaret Atwood — and I love reading books in translation. When I lived in Japan, I found and loved reading the works of Haruki Murakami. His style of writing, even though translated, and his love of jazz and cats has always been right there with me. Do you prefer to read physical or digital books? Yeung: I'm an English language arts teacher. I teach students how to critically analyze texts so I'm very much in love with physical books versus digital. I'm still very much in the world of the paper page — highlighting, underlining and annotating pages. To me, a book should be like The Velveteen Rabbit — the more dog-eared, written in and dinged up it is, the more it feels like you've loved it through the years. There's great joy in rereading a book. And I usually get my books at Audreys Books in Edmonton. The independent bookstore is great and has really been supportive of Homes from the beginning. Al Rabeeah: I like reading poetry online more than anything. I started reading poetry and poems that I would find on social media by well-known poets from the Middle East like Nizar Qabbani. I love poetry that talks about traditions and belonging to a culture. And the poetry by newer Arab poets are great as well in their own way. Yeung: It's so interesting how social media has changed how we read today. Al Rabeeah: I really got into it. And I have been writing my own poetry. It really motivated me. Yeung: In terms of poetry, I personally love poems by Mary Oliver. In terms of writers in general, it would have to be Margaret Atwood again. If I could meet Margaret Atwood, I could die happy! Yeung: I like to be curled up indoors in a blanket with my pug. I also love reading outside. Being amongst trees makes my heart happy. Al Rabeeah: I mostly read at home, and on my phone. What do you think is the lasting benefit of reading? Al Rabeeah: Books are great in that they give you more knowledge and a bigger imagination. They also help you learn more about the world. Yeung: For sure. If you can't travel, books can take you anywhere you want to go. I think the value in stories, whether it's through books, poetry, art or music, is how it can show us different perspectives, different worldviews. Really that's what our book is. It's about sharing a different worldview that we are only familiar with through newspaper headlines. On the TV news, we always see the bombed out buildings when the Syrian conflict is mentioned, but it's actually through art we find the humanity behind it. So how inspiring is it that your very first book is on Canada Reads? Yeung: As a lifelong reader I always marveled at the craft of being a writer and I always wanted to try and be an author. I'm lucky that Abu Bakr's life gave me the chance to do that. But know now that I've gone through this process I am in awe of all the editors out there. They are the unsung heroes of literature. Al Rabeeah: I would like to write another book one day. I hope to write a book of poetry!